We take photos of everything (and frequently post them on Facebook for the world to see!) From a sumptuous dessert to the Christmas tree, to the cat asleep on the sofa, a new car and a homemade dinner. We take photos to ensure that even if memory fades the details, the full glory of an event, is immortalised. 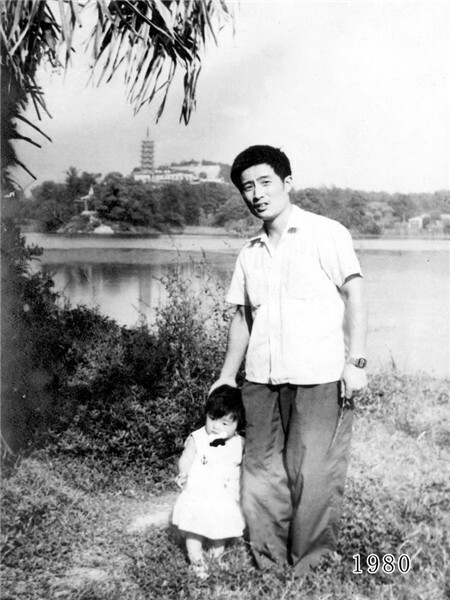 Hua Yunqing fell madly in love with his daughter Huahua from the first time he held her in his arms, just after she was born, in China, in 1979. To immortalise their relationship he ensured that they took a photo together, at the same spot by a lake in Zhenjiang, Jiangsu, every year, for 35 years. The only photo missed, was that of 1988, when Huahua was unable to join the family on their annual holiday to the lake. The photos recount their life journey in a most endearing way, which became their personal family tradition. This black and white photo – taken in 1980 – is the very first in the series. Hua is standing tall – clearly a proud father, holding the little hand of his one year old daughter Huahua, who is smiling shyly at the camera.